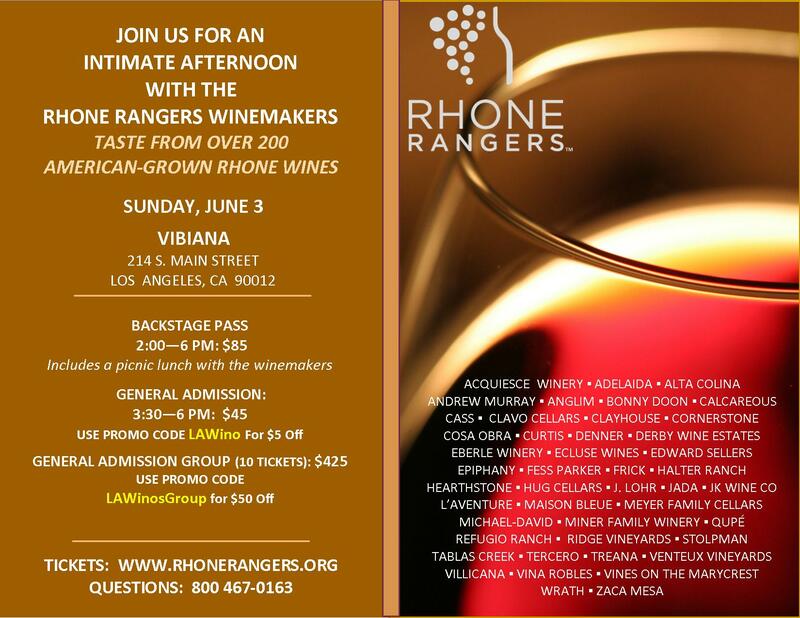 Next Sunday, Los Angeles will once again be invaded by those unpredictable mavericks of the California wine scene, the Rhône Rangers. Since the 1980s, Rhône varietals and blends have become popular alternatives to the Cabs and Merlots that used to dominate the local shelves, and the Rangers — the group of winemakers who’ve been active in growing and promoting varietals such as Syrah, Grenache and Mourvedre — have been leading that charge. The event takes place on Sunday, June 3rd, from 3:30pm to 6:00pm at Vibiana (214 S. Main Street, downtown). Over 200 wines will be poured, including examples from Young Winos favorites such as Tercero, Frick, Qupé, Tablas Creek, J. Lohr, and Vines on the Marycrest. If you need further motivation to spend your afternoon tasting vibrant whites, spicy rosés and robust reds, check out our review of the 2008 event which includes write-ups of excellent wines from some of our favorite Paso Robles and Santa Barbara wineries, such as Eberle, Ventana, Curtis, and Epiphany.